After several years in practice in Fort Worth, Texas, Dr. Bruce Bollinger took a special interest in the new and innovative technologies available for his joint replacement patients. Experiencing the disadvantages of poorly fitting implants (i.e. non-custom), extended recovery time and less than optimum range of motion of the traditional implants and surgery methods, Dr. Bollinger actively researched and pursued the very best options on the market for his patients with active lifestlyes and demands. Serving as both a consultant and trainer of other orthopaedic surgeons with these new technologies, Dr. Bollinger has achieved a unique market position being one of a selected few of orthopaedic surgeons across the county who specialized in both custom knee and hip solutions. Dr. Bollinger is currently the only orthopaedic surgeon in North Texas and Oklahoma offering these options. A graduate of the St. Louis University School of Medicine, Dr. Bollinger went on to complete a General Surgery Internship and Orthopaedic Surgery Residency at Washington University Medical School in St. Louis before starting his practice in Texas. 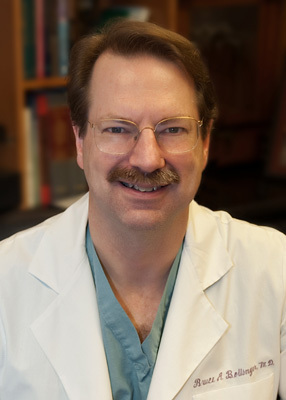 Dr. Bollinger, a member of the American Academy of Orthopaedic Surgeons, is Chief of Staff at Baylor Surgical Hospital in Fort Worth, Texas and holds several other hospital appointments in the area. In addition to custom joint replacements, Dr. Bollinger also performs arthroscopic and reconstructive surgery of the ankle, knee and shoulder.